I mentioned a few months ago how Fables and Y: The Last Man trades never seem to have any down-time; each trade contains an event, without feeling overloaded or underwhelmed as JSA sometimes does. Well ... Fables: The Mean Seasons is finally a down-time trade. The stories are good, yes, as is the art, all of it up with Bill Willingham's usual high Fables standard. But I'm glad that the next Fables trade is on the horizon, because this is a trade that will whet your appetite -- not leave you fulfilled. The Mean Seasons consists of seven issues -- a one-shot Cinderella tale, a two-part Bigby short story, and the four-part "Mean Seasons" main story. The Cinderalla has only a tangental relation to the main story, while the Bigby two-parter has no connection whatsoever. And yet, even though the Bigby story was published after "Mean Seasons," it's presented first, as if the editors recognized that the short stories were only an appetizer before the main course (lots of food metaphors. I must be hungry.). It leaves the trade feeling padded, not unlike Teen Titans: Beast Boys and Girls and Gotham Central: Half a Life. At least in this case, though, the padding tales are still legitimate Fables issues. And there's a lot here to like. Though the Cinderella story is somewhat predictable (necessary, I'm sure, but predictable), the Bigby story is good old-fashioned fun. I won't spoil anything by revealing the title, as in the table of contents: "Frankenstein versus the Wolf Man." Though I did wish that there was more of an explanation as to whether the monsters had met before, and how they influenced the history of their respective icons, I'm a sucker as it is for the old black and whites. Bring in Bela Lugosi and Godzilla, while you're at it, and I'd be in heaven. 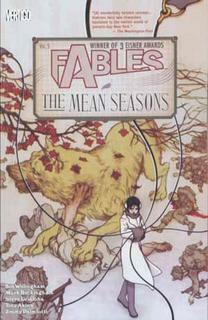 As for "The Mean Seasons" itself, Willingham employs an interesting trick here, showing just a few days in the lives of the Fables at four seasonal points throughout one year. Which means that each of the four issues picks up a few months later than the one before, with the characters having ventured slightly from their previous locations. It feels breezy and nostalgic, not quite steady, in line with the tumultuous times in Fabletown. And as is Willingham's talent, every character has a plot, or a secret, or something going on with them, making for engaging reading despite the trade's brevity. There's a murderer on the loose, and though the killer's identity becomes painfully obvious well before the end (and it's hard to believe, especially, that Mr. North doesn't figure it out even as he provides all the clues), the tragedy of the end is well played. The emotional ending loses a little if only because we haven't spent this year with the characters, only seen snippets, but still I believe we can understand where they're coming from. My hope is that, at some point, Willingham will choose to revisit "The Mean Seasons." Especially in terms of Fabletown's new government, even if the only important question is whether the new regime remains in power or not, it might still be fun to hear stories of that government from time to time. For my money, I bet Snow and Bigby will be back in their old positions soon, even if that means the non-human Fables will be coming in Fabletown (I think they will) and that Bigby will have to make peace with the Farm (ditto). But we'll see, fortunately, soon. Batman: War Games Act Three TPB - anyone get it?